Steel Panthers Main Battle Tank Game - Download and Play Free Version! Take to the field and command forces ranging form company size to a full brigade with supporting forces as you fight through a variety of scenarios which can span form 1946 to 2020. Experience the classic turn-based war strategy action that the Steel Panthers series is known for and witness some of the drastic improvements over Steel Panthers II which are present in this completely free game. Explore new unit classes with special abilities (such as paratroopers), weapons with special abilities (missiles that penetrate tanks' top armor, anti-ERA ATGM warheads), as well as new terrain types and 15 different altitude levels allowing truly mountainous terrain. With three new scenarios, pushing the grand total to more than one hundred scenarios, and a brand new campaign, you are pretty much guaranteed hours of gameplay. 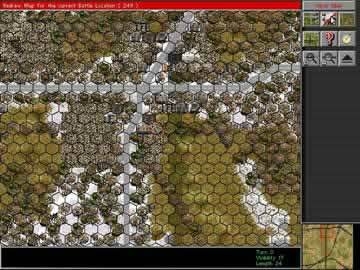 For those unfamiliar with the Steel Panthers series, the main gameplay occurs on a terrain map broken up into a hex grid. Each hex relates to about 50 meters and your forces are spread out on the map depending on the starting conditions of each level. Your units are either single vehicles (including tanks, APCs, trucks, helicopters, etc. ), infantry squads, or single heavy weapons with their crew (including everything form anti-tank rocket launchers to SAM batteries and 203 mm howitzers). 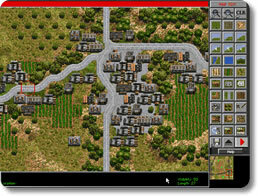 During your turn you can move your units and issue commands with the mouse and a few keyboard hot keys. 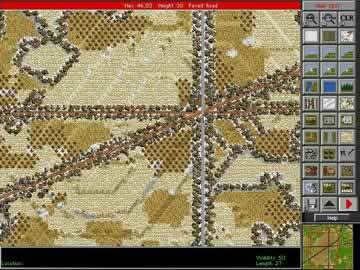 Units may freely move and fire, but moving quickly depletes the number of shots for that turn and vice versa. Another key feature to your units is suppression and morale. Enemy fire and casualties add suppression, which makes hitting harder and may force a unit to become pinned, buttoned down, or routed. Leader units can reduce these effects by rallying troops, however a unit that is routed usually is quickly cut down or blown apart. With almost 90 different countries and factions available as combatants, there are a wide variety of possible strategies which you can explore. Figure out your own style of play and which battle plans work best for the different nations, such as which strategy should Cuba employ or the best plan of action for Sweden. Push your tactical skills to the limit with the wide array of scenarios which are possible in this latest update to the familiar franchise. So if you like turn-based strategy or are any fan of the Steel Panthers series, then download Steel Panthers Main Battle Tank for free today!